Monica Frassoni is an Italian politician and former MEP (1999-2009). During that time, she was co-chair of the European Greens–European Free Alliance group in the European Parliament. Currently, she is co-President of the European Green Party. The beginning of the work of the European Commission on a long-term strategy to reduce greenhouse gas emissions is good and timely. First, Europe needs to step up its efforts to implement the Paris Agreement, where the EU and Member States committed to achieve ambitious emission reductions objectives. Second, there is acknowledgment that transforming the energy system is necessary to combat climate change. The switching pace should be faster to be more adequate to address the its unprecedented challenges, but things are coming together and some indicators, as the introduction of the Energy Efficiency First principle in the Regulation of the Governance of the Energy Union, are very encouraging. Third, the EU project is in an extremely difficult moment and its future is at risk. The falling appetite for European legislation must be clearly resisted and defeated over the next months and years. Areas such as climate change represent a unique opportunity to develop policies and regulation of common interest and deliver tangible results to European citizens. Indeed, a recent EU-wide survey shows that 92% of EU citizens see climate change as a serious problem and support action across the EU to tackle it. On the 2050 energy and climate strategy the European Commission must dare to be bold and send the right political messages to citizens, businesses and the international community. The long-term emissions reduction strategy can only be developed correctly if it is based on the latest available science. From our understanding, the IPCC Special Report Global Warming of 1.5°C due to be published next October will conclude that the upper temperature goal of the Paris Agreement of 2°C does not represent a climate safe zone. As such, the EU long term energy and climate strategy must clearly lay out pathways for how the bloc will contribute to limiting global temperature rise to 1.5°C, including a net-zero emissions target by 2050 at the latest. This transformation of European economy must be achieved over time but also on time. Hence, the EU, needs to urgently and substantially increase its action well beyond the current 2030 targets. In this scenario, Energy Efficiency plays a fundamental role. The EU must take into account that global energy demand rose in 2017 by 2.1%, out of which 70% came from fossil fuels. The EU strategy must therefore pursue a review of energy and climate targets with the long-term goal to further reduce energy consumption and phase out fossil fuels. Energy efficiency measures must be put on an equal footing with other supply side investment options. Efficiency First principle boils down to making informed choice to invest taxpayers’ money in cost-effective energy measures. According to the IEA, energy efficiency makes the largest contribution to the global emissions reduction in the EU, able to deliver 76% of those needed to achieve Paris Agreement objectives. Enshrining the Efficiency First principle in long-term strategy will enable countries to maximize their energy gains while fostering a growing integration of renewables and making more affordable the electrification of key sectors like transport and heating & cooling. According to the European Commission, the new EU targets for energy efficiency (32.5%) and renewables (32%) translate into 46% GHG cuts. To achieve net 0 by 2050 at the latest, the Commission should propose a scenario of 55-60% GHG emission reduction by 2030. The consultations held by DG ENER on energy system modelling have shown that PRIMES model is inadequate to address energy efficiency. It is crucial to work on the PRIMES model’s weaknesses integrating the wider spectrum of energy and non-energy benefits of energy efficiency, such as energy security, public health, improved air quality and support of innovation and competitiveness. In previous EU Impact assessments, the investment costs and financial savings of energy efficiency were unfairly presented. In particular, a discount rate of 10% was applied to value energy efficiency investments, which made them look more expensive. The Commission should instead consider a lower societal discount rate – which is more aligned with those applied by Member States (between 4.0-5.7%) – and the costs of delayed actions and of non-action. The EU long-term emissions reduction strategy is a unique window of opportunity for the EU to attract investments in cost competitive technologies that will drive emissions reductions. 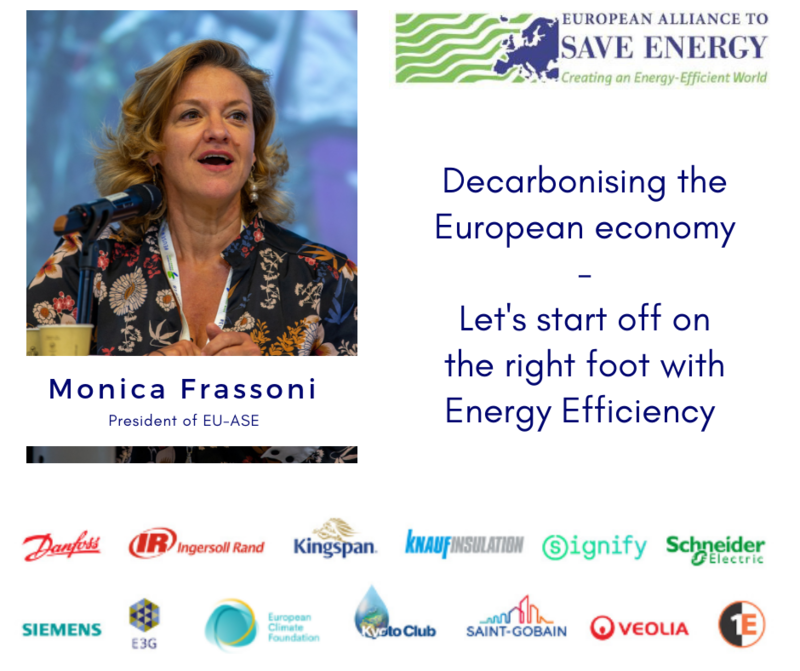 A forward-looking strategy will make Europe progress as a strong competitive and innovative energy efficiency market from where European companies can spearhead the energy transition and commercialize their technologies and know-how globally.